Breese started her music education at the young age of 9 on classical piano and began to write her own classical pieces at the age of 13. After a couple years of writing classical music, she decided to try her hand at pop songs. During high school, a music teacher mentored her after school once per week and tutored her in songwriting formulas and styles. This was quite encouraging to young Breese as she continued to hone her songwriting skills. There was a drawback to playing piano, however. Breese found herself left out at all the campfire jams...a piano is not easy to transport. 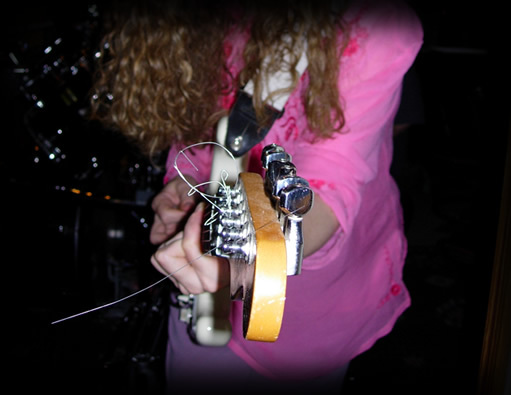 Breese tried her hand at guitar during high school because she wanted to learn an instrument she could actually carry around, but quickly gave up because it was simply too painful. 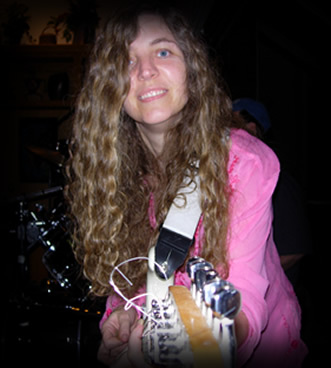 During this time she began to listen to all kinds of music, and when she heard the likes of Eric Clapton, Jimi Page, Jimi Hendrix and many others in the classic rock genre, she realized that guitar was going to be her best instrument for writing rock and roll songs, which was what she wanted to do. She gave up her social life and hibernated in her room for three years between the ages of 19-22. She did nothing but eat, sleep and drink guitar. She struggled through the first six months of pain from bar chords, callous building on the fingertips, and dexterity exercises until the muscles burned. She didn't have much in the way of formal guitar lessons. She had hundreds of lessons on piano already, so she had enough theory knowledge and a good enough ear to copy licks off her favorite artists' albums. She did take a few guitar lessons here and there when she got stumped, learned a bit about scales and fingerpicking styles, but for the most part she learned on her own. She continued to write songs and hone her style. She began to play with a bassist and drummer, and within the first couple months her first band was born as a power trio, The Breeze Band. 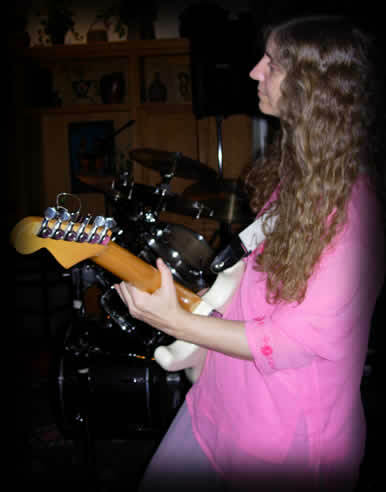 Shortly after, a second guitar player was added so as to free her up to do more with her own guitar work and vocals. She gigged heavily for two straight years, playing 4-5 nights a week, mostly playing her originals with the minimum amount of necessary classic rock covers to keep people on the dance floor. She played Bonnie Raitt, Doors, Creedence Clearwater, Allman Brothers, Grateful Dead, fingerpicking blues and many other cover songs that were complimentary to her originals. Her originals rocked and fit right in! The Breeze Band played the tri-state area of New York (city), New Jersey and Pennsylvania. It wasn't long before she had a dedicated following, had airplay on the radio, and was in the studio making a record. She was well on her way to making it in the music business. However, a stalker made her realize that perhaps fame was not such an inviting proposition after all. The prospect was becoming a bit frightening. She decided to take a break for a little while, and travel the world for a year. She had never been anywhere in her life and felt that in order for her songwriting to be more powerful, she needed some broader experiences anyway than the small Pennsylvania town where she lived. Breese took a crash course in Spanish, slung on her back pack and traveled to countries in South America, the Mexican Peninsula, and many other countries and islands too numerous to list. She hiked many parts of the trails in the USA wildernesses including the Pacific Crest Trail, Appalachian Trail, the Gila Wilderness in New Mexico, and she even trekked through Utah and Arizona. She lived in Colorado for a while, enjoyed the Key West scene, went on many Grateful Dead tours, and finally settled in California. California felt like she had come home to where she always belonged. Ever since she was a young girl she knew she was California bound. Needless to say, a year had turned into many years. However, her songs were still played on the radio in Pennsylvania, and the indie record company kept asking her when she would be ready to get back into the game. "Soon!" she always said, believing it. She always thought she would get back into music, even though she had only meant to take a year off and it was turning into many. However, fate had some other ideas. Breese decided that she wanted to learn how to use all the equipment in the studio, for she felt helpless during her first experience with recording in the studio, having no technical knowledge about how it all worked. She wanted to learn the art of audio engineering and be able to use the equipment herself. She went to college and attained a degree in Audio Engineering. Since she had always been interested in film-making, she decided to continue her education and learn about film-making. This led to the attainment of another degree in Video & Film Production. Breese went straight into the video and film industry and worked as an audio technician for Disney on several TV shows, one of which was the Mickey Mouse Club (called MMC Raps!) where she met Christina Aguilera and Britney Spears before they were stars. The cast also included Justin Timberlake and TJ Evans of the future N'Sync Boys. She also worked on many commercials and independent films. It was an excellent introduction to all the ins and outs of film-making. She then traveled some more, revisiting the TV and film industry or working odd jobs when she needed more money for her travels. She learned meditation and yoga styles, explored spirituality deeply, met gurus, yogis and spiritual teachers, and still practices spiritual methods to this day. Then one day, music came back a-knockin. Breese was at a friend's house one evening and saw his guitar sitting on the couch. She asked if she could play it just to see if she could still play. She had sort of forgotten about music. She had become so distracted by life and its many diversions. It seemed she had lived a few lives in one, each chapter being focused on a different pursuit. Music had been on the back burner far too long. When she began to play his guitar, it was all still there. A little rusty, but still there. He was shocked that she hadn't played for 15 years. "It's a crime that you're not playing music! People need to hear you. I don't know of any woman who plays like you. You have to get back into it. Here! Take this guitar, take this amp, it's yours! Use it as long as you want! Just play!" He was her "music angel" sent to get her back into music. She still calls him her "music angel!" At first Christine was a little reluctant. After all, who has time? Work keeps the roof over the head, friendships take up time, and just maintaining a life is quite consuming. However, looking at that guitar sitting there in her living room was too much temptation to resist. She began to play. It wasn't long before the music fever caught her again and she couldn't get enough guitar in a day. It wasn't very easy to get her chops back. She had to relearn all her songs because she couldn't remember them. Fortunately she had many of them stored on tape, although some are lost to the annals of time forever. It took a year of struggling through joint pain, and dexterity exercises. Just attaining the strength to play bar chords again was no small task. At one point she wasn't sure she would really be able to get it all back because she was in so much pain. However, she persisted and by the end of a year, she was back on board as the lead guitar player in a couple bands in her local area. She felt like she had come full circle when she found herself back onstage again, like she had never left. After all, playing guitar is her very favorite thing to do in the whole world. Now she plays with several bands and has her own band, The Christine Breese Band. She is currently in the studio with her music buddies recording her first CD in decades and has written all sorts of new songs. She wonders sometimes why it took her so long to get back to her roots again, but it feels right to be back. "Better late than never, and fortunately I still look young so I have at least another 30-40 years of rock and roll in me!" she says. Her future plans include soundtracks for films and TV, many more CDs since she has so many songs, and lots of live concerts at the festivals and fairs. Christine will never abandon her guitar again, and she will play until the day it is no longer possible!